Roadsides, yards, and disturbed places; spreading in forests and on shores. An occasional weed or waif first collected in Ingham Co. in 1887; often planted as a cover crop but not so common out of cultivation as many of our forage grasses. We have both var. perenne and var. aristatum Willd., the latter often recognized as a distinct species, L. multiflorum Lam. 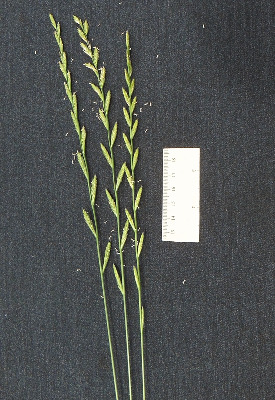 It differs from typical L. perenne in the following characters: lemmas awned (not awnless), 10 or more in a spikelet (not 10 or fewer); rachis scabrous on convex surface as well as edges (not on edges only); auricles prominent, elongate (not absent or small); leaf blades in young shoots inrolled at the margins (not merely folded lengthwise); plants annual or biennial (not perennial). The two taxa evidently hybridize, and our populations include so many specimens that are somewhat intermediate as to make recognition of two entities arbitrary. MICHIGAN FLORA ONLINE. A. A. Reznicek, E. G. Voss, & B. S. Walters. February 2011. University of Michigan. Web. April 21, 2019. https://michiganflora.net/species.aspx?id=2147.